Experienced, commercially-focused economist and research professional. Firms aren’t matching talent to their top markets. Having the right people in the right places would boost the economy by millions. You are the CEO of a major multinational services company, headquartered in London. Over the past few years, your business has been growing exponentially in your best-performing markets. Yet your balance sheets aren’t showing the profits you anticipated. You call a meeting of senior management, all of whom work in the central office, and ask: what’s going wrong? Nobody seems to know. It seems that achieving the top- and bottom-line performance competitors are driving is just that little bit harder than you thought. In fact, the answer could be sitting in that very room. Why, if you’re trying to build and drive productivity in your best-performing markets, is your talent sitting at home, rather than being on the frontlines of that market potential? This is the talent-to-market alignment gap. If a company is attempting to drive performance in its biggest markets, then it needs to hire or appoint people who know the business best and team them with those who are familiar with those markets to drive competitive market performance. If it doesn’t, it may be missing out on major productivity opportunities. Closing this gap could lead to big gains for everyone. 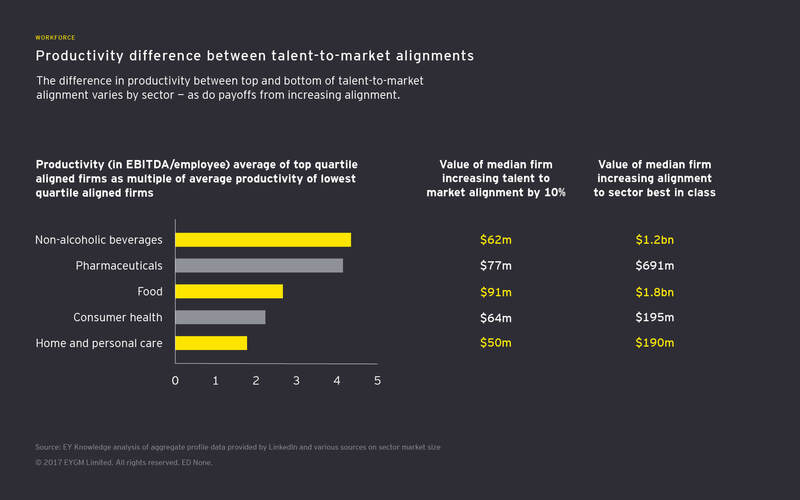 EY has estimated that if firms headquartered in the UK could get their talent-to-market alignment up to US standards, it could represent a $900 billion uplift to the national economy from the resulting higher productivity. It’s time to get serious about talent alignment. If the average pharmaceutical company increased its talent-to-market alignment by just 10%, it could see $77m in additional profits. This trend is repeated across sectors and geographies. But how do we know this? And how can we help firms close this gap between talent and market opportunity? To answer these questions, we have teamed up with LinkedIn in a groundbreaking study designed to uncover the potential links between talent allocation and business performance. LinkedIn provided aggregate public profile data from its professional community of more than 530 million people globally to give us a comprehensive view of the world at work. By combining these two sets of knowledge, the team was able to determine how well firms were matching their top talent with their market opportunities — expressed as a number from 0 to 1 — and how this was driving business performance. 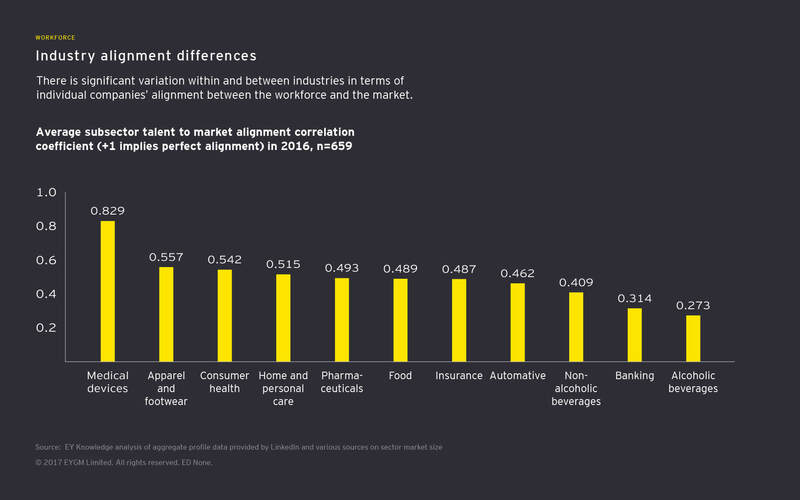 For each sector and subsector, EY identified the size of market opportunities through our own insights and through data taken from third-party sources that included World Bank, the International Monetary Fund and the OECD. For each subsector, a list of major competing companies was compiled. LinkedIn data was examined to determine how many of each company’s employees were located in various global markets. LinkedIn data could also be used to determine the seniority and business function of these employees. The geographical distribution of talent was then correlated with the relative size of the market. This allowed the team to determine whether companies were allocating the right talent to the most important markets. The correlation between talent and market opportunity was then cross-referenced with key performance indicators to see the effects of better talent allocation. Major opportunities exist for firms to improve their talent-to-market-opportunity alignment. Companies with a better talent-to-market rating tended to be higher-performing. Countries in which companies have better aligned talent tend to have more productive economies. A score of 1 would mean that company’s talent distribution was perfectly aligned with its market opportunity. A score of 0 would mean there was no relationship at all between how a company was distributing its talent and where its market opportunities lay. The average score was 0.48. Some sectors fared substantially better than others. The best-performing was the medical devices sector, which scored an average of 0.829. The worst-performing was the alcohol beverages sector, which scored an average of 0.273. For each of these indicators, the study found a strong correlation between a company’s score and its performance. Better talent alignment means higher productivity: The non-alcoholic beverages sector saw some of the most dramatic differences in productivity between the best- and worst-performing firms. Firms with scores in the top quartile saw productivity figures of $132,068 EBITDA per employee. That’s about 4.3 times higher than those in the bottom quartile, who saw average productivity of $30,397 per employee. 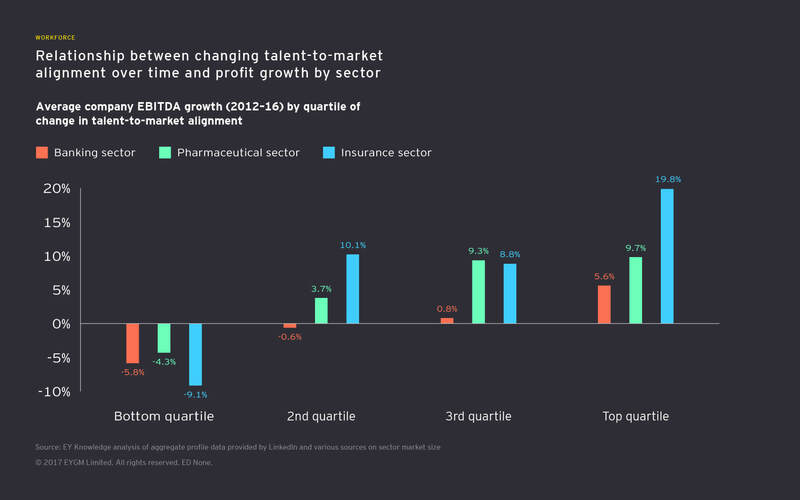 Better talent alignment means higher overall profits: Firms with higher talent-to-market scores also posted higher absolute EBITDA profit levels. The findings from the consumer health sector provided the clearest examples of this. 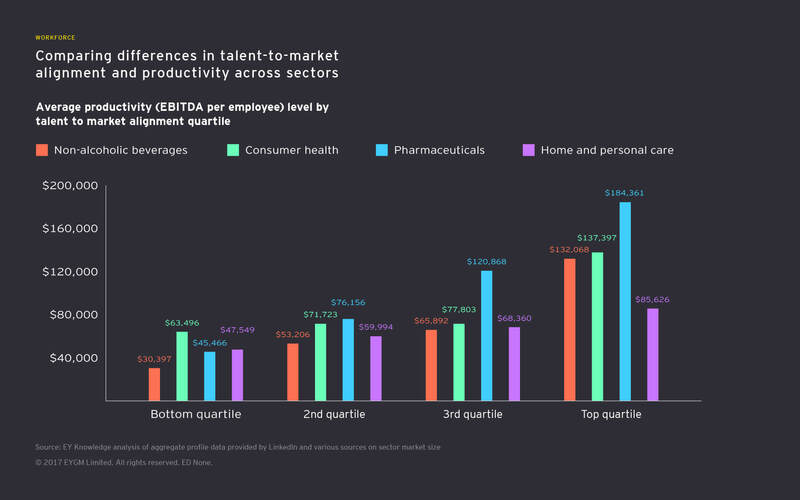 Firms in the top quartile of talent-to-market alignment scores reported overall earnings of more than $6.8 billion, around 25 times higher than the average earnings figure of $273 million reported by firms in the bottom quartile. 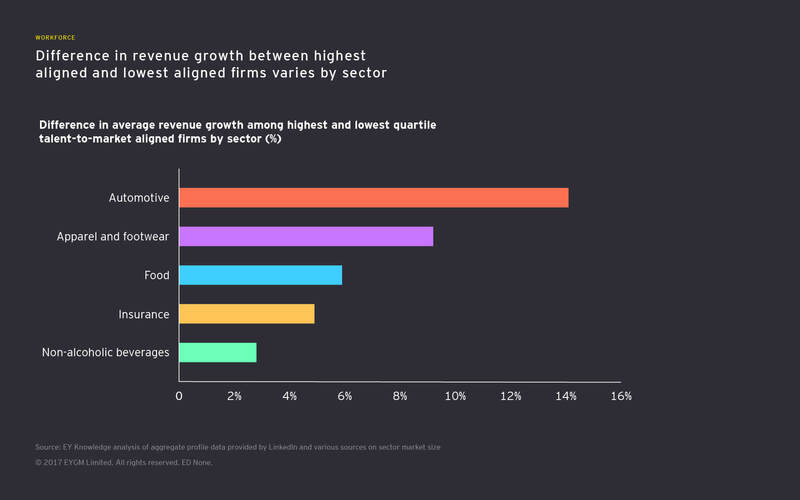 Better talent alignment means better revenue growth: The difference in revenue growth between the best- and worst-performing firms was most dramatically illustrated in the automotive sector. Firms in the top quartile saw growth figures of 9.8% between 2012 and 2016. Firms in the bottom quartile, on the other hand, saw revenue growth decline by 4.3% over the same period. Getting talent aligned to market opportunity was worth a massive 14.1 percentage points in terms of revenue growth. This isn’t just correlation. By looking at firms whose talent-to-market scores have improved or worsened over time, and their corresponding levels of profitability, a clear relationship can be seen. 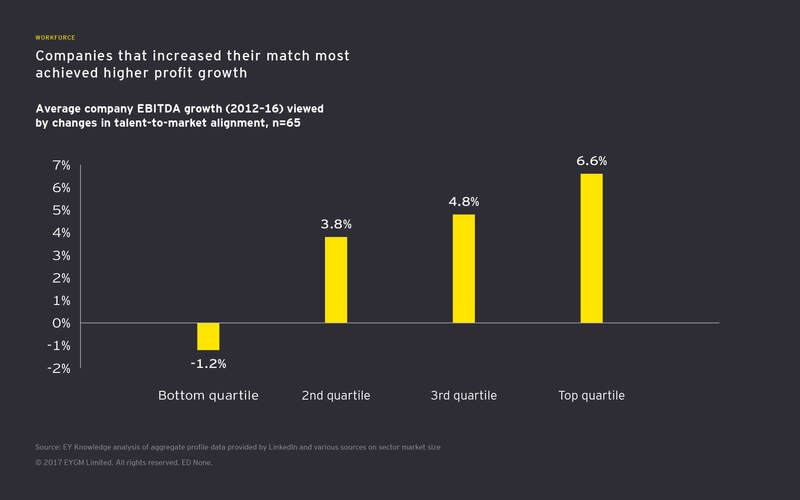 From 2012 to 2016, the quartile of firms making the biggest improvements in their market alignment saw an average 6.6% increase in their EBITDA profits. Firms in the bottom quartile saw their profits decline by an average of 1.2%. These aren’t gains that companies can afford to take lightly. In the insurance sector, firms in the bottom quartile saw EBITDA growth drop by a massive 9.1%. Put another way: if a median firm in the food sector could improve its talent-to-market alignment by just 10%, it could see an increase in profits of $91 million. By improving its talent-to-market alignment to best in class, it could realize bottom-line gains of $1.2 billion. It shouldn’t be surprising that firms who can best align talent and market opportunity outperform the rest. You would expect a company developing products for a particular market to perform better if its product portfolio was better aligned to that market — and if commercial teams were able to be more agile to respond to changing customer needs, whether that meant relocating key staff or hiring locally. But in addition to this, the study found that companies that are headquartered in certain countries had a higher global talent to market alignment and they performed better than competitors who are headquartered in other countries, and therefore made a more positive impact on their national economies as well. Closing the alignment gap for businesses headquartered in other countries could hold substantial rewards for their respective countries and market economies. 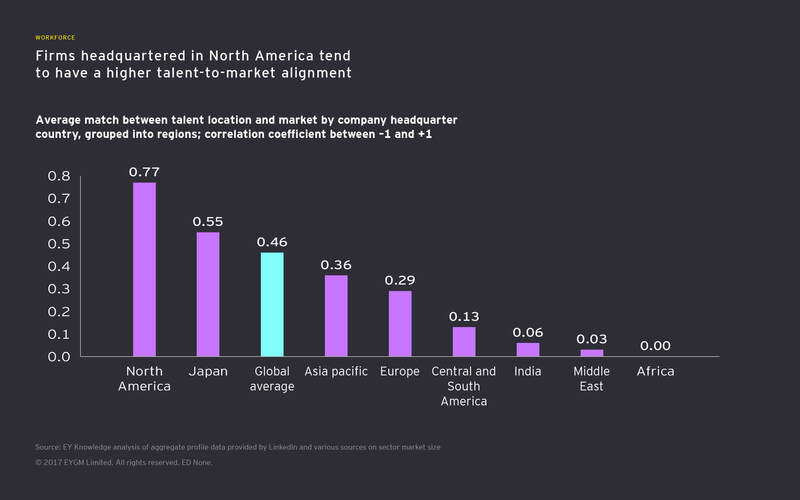 North America leads the way in this regard — companies headquartered in the US have an overall better talent-to-market alignment than businesses headquartered in other countries. The average North America-headquartered company has a talent alignment coefficient score of 0.77. Japanese-headquartered firms also performed above the global average, with a score of 0.55. Europe, on the other hand, lagged far behind, with an average alignment score of 0.29, although Ireland was a significant outlier. Since the 2008 financial crisis, the world has gone through a period of stagnating productivity. The International Monetary Fund has found that if productivity rates had continued trending upward as they had before the crisis, global economic output today would be around 5% higher than it is — the equivalent of adding income the size of Japan to the global economy. The fact that this growth has not emerged has put pressure on living standards, expanded the inequality gap and jeopardized the stability of developing economies. In the light of the proven correlation between better talent-to-market alignment and profit per employee, i.e., productivity ratings, getting better at aligning top talent with market opportunities could play a key role in reversing this trend and driving a healthier, more powerful global economy. Understand where you play: If a company is to properly map its talent to its key markets, the first step is to identify the highest-opportunity markets. This should begin with a preliminary analysis of the internal data to get a sense of where current markets exist, what other markets present opportunities, and where your talent is currently located. 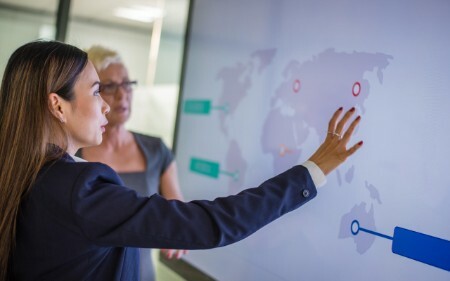 After this, a company looking to improve its alignment should add other categories of data, such as demographics and diversity data, seniority of talent, and subsector analysis findings. Move people into place: Once a company has determined its market opportunities, it needs to put the right people in place to take advantage of these opportunities. Talent can be found externally, by hiring locally in the relevant markets. 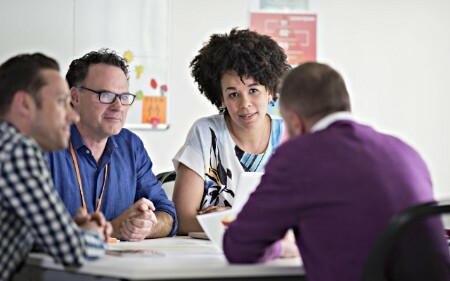 And it can be reassigned internally, which will require a long-term talent alignment and mobility strategy that accommodates transfer arrangements, overseas housing and family services such as schools, and a rigorous framework to manage immigration and tax compliance for both the individual and the corporation. People analytics provides data-driven insight for workforce strategy and planning, so that talent can be managed and developed to deliver clear business outcomes. Does your company understand the competitive advantage of better matching your talent footprint with key market opportunities? 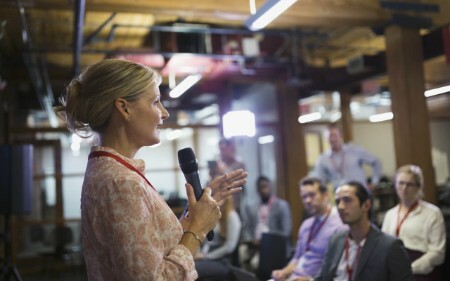 Do C-suite executives and business leaders know the value of what’s at stake? How often does your company review the shifts in global market opportunity, and how is that linked to your talent strategy? Does your company understand the importance of sub-subsector shifts, role types, seniority, automation offshoring/wage arbitrage opportunities and diversity considerations when developing talent strategies? Does your company’s talent strategy take into account the importance of having international talent rotate through the home office, succession planning, engagement and performance management linkages? Who owns the topic of mobile talent in your organization? Is it viewed as strategic or ad hoc? Does it connect to and act in response to a larger talent strategy? Does national policy support domestic companies successfully reaching other geographies? What barriers exist that may discourage better talent-to-market alignment? Do policymakers understand the value and opportunity to the national economy of domestic companies better participating in international markets? Is there untapped opportunity in having investments make a better (and earlier) match to global opportunities? Is your investment strategy to reach global market opportunities and economies of scale and scope focused more through individual companies with a global footprint or a portfolio of market-specific companies? Only by asking these questions and addressing them swiftly can organizations realize the full potential of their people, their markets and their purpose. It's time to align talent to opportunity. Download the report in PDF here. Aligning talent to market opportunity can create increased productivity, profit and drive sustainable growth.